UCB Canada Inc. announced today that Health Canada has approved NEUPRO® (rotigotine), the first and only non-ergolinic dopamine agonist available in a patch, to treat the signs and symptoms of idiopathic Parkinson’s disease (PD) and moderate-to-severe idiopathic restless legs syndrome (RLS), also known as Willis-Ekbom disease, in adults. NEUPRO® is the first new treatment for Parkinson’s disease approved by Health Canada in five years and provides 24-hour delivery of rotigotine through the skin into the blood stream. NEUPRO® has demonstrated efficacy in managing motor symptoms associated with Parkinson’s disease. UCB Canada Inc. is undertaking all measures required to supply the Canadian market with NEUPRO. Although the precise mechanisms of action of NEUPRO® as treatment for PD and RLS are unknown, as a PD treatment, the mechanism of action is thought to be related to increasing the activities of the dopamine receptors within the caudate-putamen, the region of the brain that regulates movement. Similarly, in RLS, the mechanism of action of NEUPRO® is thought to be related to its ability to stimulate dopamine receptors. The effectiveness of NEUPRO® (rotigotine) in the treatment of Parkinson’s disease was evaluated in a multinational drug development program consisting of four randomized, double-blind placebo-controlled phase 3 trials. A total of seven Canadian trial sites were involved in the international studies. In all trials, patients underwent a weekly titration of NEUPRO® in 2 mg/24 hour increments to the assigned or optimal dose. In two trials, statistically significant improvements in the combined scores on the Unified Parkinson’s Disease Rating Scale (UPDRS) were observed in early-stage PD patients receiving NEUPRO® compared to patients receiving placebo. The UPDRS is a validated multi-item rating scale intended to evaluate mentation (mental activity), activities of daily living (ADL), motor performance, and complications of therapy. The two trials measured only the ADL and motor performance sections of the UPDRS. The UPDRS contains 13 questions relating to ADL, such as speech, dressing, and cutting food with utensils, and 27 questions related to the cardinal motor symptoms in PD patients—i.e., tremor, rigidity, bradykinesia, and postural instability. Two trials of NEUPRO® in patients with advanced-stage PD examined change from baseline in “off” time, periods when the effectiveness of medication wears off and PD symptoms return. Statistically significant changes in off-times were observed in advanced-stage PD patients receiving NEUPRO® compared with those who received placebo. The effectiveness of NEUPRO® in the treatment of Restless Legs Syndrome (RLS) was evaluated in two fixed-dose, randomized, double-blind, placebo-controlled phase 3 trials with maintenance periods of 6 months duration. Patients received NEUPRO® doses ranging from 0.5 mg/24 hours to 3 mg/24 hours, or placebo, once daily. Statistically significant improvements in sum scores on the International RLS Rating Scale (IRLS Scale) and the Clinical Global Impression – Improvement (CGI-I) assessment were observed in RLS patients receiving NEUPRO® compared with those receiving placebo. The IRLS Scale contains 10 items designed to assess the severity of sensory and motor symptoms, sleep disturbance, daytime somnolence, and impact on activities of daily living and mood associated with RLS. The CGI-I is designed to clinically assess RLS symptoms on a 7-point scale. In clinical trials, treatment emergent adverse events reported in more than 10% of patients treated with NEUPRO® for Parkinson’s disease included nausea, vomiting, dizziness, somnolence, application site reactions and headache. Treatment emergent adverse events reported in more than 10% of patients treated with NEUPRO® for Restless Legs Syndrome, included nausea, application site reactions, fatigue and headache. Parkinson’s disease (PD) is a chronic, degenerative neurological disease which affects approximately 100,000 Canadians. PD develops with the loss of nerve cells in the brain that produce a chemical called dopamine. The symptoms of PD can have an impact on many dimensions of patients’ lives. As dopamine levels fall, movement (motor) symptoms—tremors (uncontrollable shaking), rigidity (stiffness or muscle tensing) and bradykinesia (slowness and loss of spontaneous movement) — can progress, along with the underlying symptoms of PD, which are less well recognized and may be under-treated. Restless Legs Syndrome (RLS) is a neurological disorder characterized by unpleasant sensations in the legs and an uncontrollable urge to move to gain relief. Over 80% of people with RLS also have periodic limb movement disorder (PLMD), which causes rhythmic limb movements during sleep. RLS affects between three and 10 per cent of the population to some extent. Some estimates are much higher because RLS is thought to be underdiagnosed, and in some cases, misdiagnosed. Most people with RLS have difficulty falling asleep and staying asleep. Daytime symptoms of RLS, such as inability to sit still and involuntary leg jerks, are increasingly recognized. While the underlying pathophysiology of RLS is not fully understood, it is thought to involve central dopamine systems. Recent neuroimaging data suggest that RLS patients may carry an abnormality in dopamine transport that can be visualized both day and night. RLS can cause exhaustion and daytime fatigue, and may affect work and personal relationships. Patients with moderate-to-severe RLS are often unable to concentrate, have impaired memory, or fail to accomplish daily tasks. These patients may require long-term treatment for their RLS symptoms. Inspired by patients and driven by science, UCB Canada Inc. is a biopharmaceutical company focused on the discovery and development of innovative medicines and solutions to transform the lives of people living with severe auto-immune and central nervous system diseases. For more information, please consult www.ucb.com/worldwide/canada. 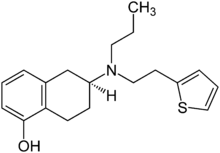 Rotigotine (Neupro) is a dopamine agonist of the non-ergoline class of medications indicated for the treatment of Parkinson’s disease (PD) and restless legs syndrome (RLS) in Europe and the United States. It is formulated as a once-daily transdermal patchwhich provides a slow and constant supply of the drug over the course of 24 hours. Like other dopamine agonists, rotigotine has been shown to possess antidepressanteffects and may be useful in the treatment of depression as well. Rotigotine was developed by Aderis Pharmaceuticals. In 1998, Aderis licensed worldwide development and commercialization rights for rotigotine to the German pharmaceutical company Schwarz Pharma (today a subsidiary of the Belgian company UCB S.A.). The drug has been approved by the EMEA for use in Europe in 2006 and is today being sold in several European countries. In 2007, the Neupro patch was approved by the Food and Drug Administration (FDA) as the first transdermal treatment of Parkinson’s disease in the United States. However, as of 2008, Schwarz Pharma has recalled all Neupro patches in the United States and some in Europe because of problems with the delivery mechanism. The patch was reformulated, and was reintroduced in the United States in 2012. Rotigotine has been authorized as a treatment for restless legs syndrome since August 2008. Rotigotine is analogous to 7-OH-DPAT and UH-232, all three of which are aminotetralinderivatives. These compounds are similar in structure to dopamine, likely underlying theirpharmacology. Cusack, N. J.; Peck, J. V.; Drugs Future 1993, 18, 1005. Soliris is a formulation of eculizumab which is a recombinant humanized monoclonal IgG2/4;κ antibody produced by murine myeloma cell culture and purified by standard bioprocess technology. Eculizumab contains human constant regions from human IgG2 sequences and human IgG4 sequences and murine complementarity-determining regions grafted onto the human framework light- and heavy-chain variable regions. Eculizumab is composed of two 448 amino acid heavy chains and two 214 amino acid light chains and has a molecular weight of approximately 148 kDa. Atypical Hemolytic Uremic Syndrome (aHUS) Canada is thrilled by Health Canada’s recent approval of Soliris® (eculizumab) for the treatment of patients with atypical Hemolytic Uremic Syndrome (aHUS), 1 a very rare, chronic and life-threatening genetic condition affecting fewer than 60 patients in Canada. aHUS Canada was formed in November 2012 to support Canadian patients and families living with aHUS. In addition to establishing a Canadian aHUS community, the group is committed to building public awareness and understanding of aHUS and advocating for the best possible care and treatment for patients. For more information, please visit http://www.ahuscanada.org. 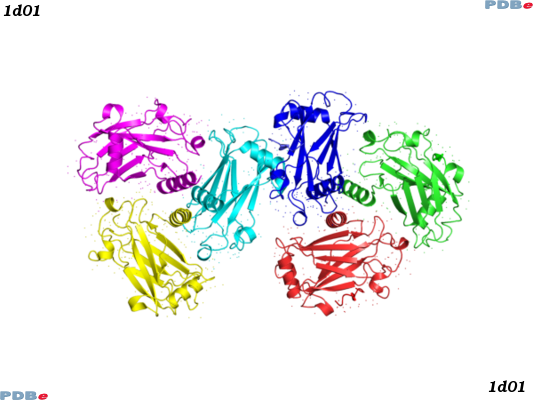 Eculizumab (INN and USAN; trade name Soliris®) is a humanized monoclonal antibody that is a first-in-class terminal complement inhibitor and the first therapy approved for the treatment of paroxysmal nocturnal hemoglobinuria (PNH), a rare, progressive, and sometimes life-threatening disease characterized by excessive destruction of red blood cells (hemolysis). It costs £400,000 ($US 600,000) per year per patient. Eculizumab also is the first agent approved for the treatment of atypical hemolytic uremic syndrome (aHUS), an ultra-rare genetic disease that causes abnormal blood clots to form in small blood vessels throughout the body, leading to kidney failure, damage to other vital organs and premature death. In clinical trials in patients with PNH, eculizumab was associated with reductions in chronic hemolysis, thromboembolic events, and transfusion requirements, as well as improvements in PNH symptoms, quality of life, and survival. Clinical trials in patients with aHUS demonstrated inhibition of thrombotic microangiopathy (TMA), the formation of blood clots in small blood vessels throughout the body, including normalization of platelets and lactate dehydrogenase (LDH), as well as maintenance or improvement in renal function. Hillmen, Young, Schubert, P, N, J, et al (2006). “The complement inhibitor eculizumab in paroxysmal nocturnal hemoglobinuria”. N Engl J Med 355 (12): 1233–1243. doi:10.1056/NEJMMoa061648. PMID 16990386. Noris, Caprioli, Bresin, M, J, E, et al. (2010). “Relative role of genetic complement abnormalities in sporadic and familial aHUS and their impact on clinical phenotype”. Clin J Am Soc Nephrol 5: 1844–1859. Caprioli, Noris, Brioschi, J, M, S, et al (2006). “Genetics of HUS: the impact of MPC, CFH, and IF mutations on clinical presentation, response to treatment, and outcome”. Blood 108: 1267–1279. Hillman, Hall, Marsh, P, C, JC, et al (2004). “Effect of eculizumab on hemolysis and transfusion requirements in patients with paroxysmal nocturnal hemoglobinuria”. N Eng J Med 350: 552–559. Ray, Burrows, Ginsberg, Burrows, JG, RF, JS, EA (2000). “Paroxysmal nocturnal hemoglobinuria and the risk of venous thrombosis: review and recommendations for management of the pregnant and nonpregnant patient”. Haemostasis 30: 103–107. Kelly, Hill, Arnold, RJ, A, LM, et al (2011). “Long-term treatment with eculizumab in paroxysmal nocturnal hemoglobinuria: sustained efficacy and improved survival”. Blood 117: 6786–6792. .Soliris® (eculizumab) prescribing information (2011). Cheshire, CT: Alexion Pharmaceuticals. http://www.soliris.net/sites/default/files/assets/soliris)pi.pdf. Lurasidone (trade name Latuda) is an atypical antipsychotic developed by Dainippon Sumitomo Pharma. It was approved by the U.S. Food and Drug Administration (FDA) for treatment of schizophrenia on October 28, 2010 after a review that found that two of the four Phase III clinical trials supported efficacy, while one showed only marginal efficacy and one was not interpretable because of high drop-out rates. It is currently pending approval for the treatment of bipolar disorder in the United States. In clinical studies, lurasidone alleviates positive symptoms (e.g., hallucinations, delusions) without inducing extrapyramidal side effects except for akathisia, despite its potent D2 antagonistic actions. Effectiveness against negative symptoms of schizophrenia has yet to be established. Meyer JM, Loebel AD, Schweizer E (September 2009). “Lurasidone: a new drug in development for schizophrenia”. Expert Opinion on Investigational Drugs 18 (11): 1715–26. doi:10.1517/13543780903286388. PMID 19780705. “FDA approves Latuda to treat schizophrenia in adults” (Press release). USFDA. 2010-10-28. Retrieved October 29, 2010. FDA Clinical Review of lurasidone for the treatment of schizophrenia Nakamura M, Ogasa M, Guarino J, et al. (June 2009). “Lurasidone in the treatment of acute schizophrenia: a double-blind, placebo-controlled trial”. The Journal of Clinical Psychiatry 70 (6): 829–36. doi:10.4088/JCP.08m04905. PMID 19497249. Ishiyama T, Tokuda K, Ishibashi T, Ito A, Toma S, Ohno Y (October 2007). 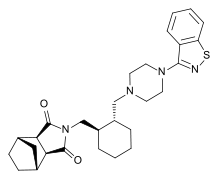 “Lurasidone (SM-13496), a novel atypical antipsychotic drug, reverses MK-801-induced impairment of learning and memory in the rat passive-avoidance test”. European Journal of Pharmacology 572 (2-3): 160–70. doi:10.1016/j.ejphar.2007.06.058. PMID 17662268. Enomoto T, Ishibashi T, Tokuda K, Ishiyama T, Toma S, Ito A (January 2008). “Lurasidone reverses MK-801-induced impairment of learning and memory in the Morris water maze and radial-arm maze tests in rats”. Behavioural Brain Research 186 (2): 197–207. doi:10.1016/j.bbr.2007.08.012. PMID 17881065. Dainippon Sumitomo Pharma (August 26, 2009). “Lurasidone Demonstrated Efficacy in Treating Patients with Schizophrenia in Pivotal Phase III Study”. “Latuda: Prescribing Information”. Psychotherapeutic Drugs. Retrieved 2010-12-17. “Atypical antipsychotics and risk of cerebrovascular accidents”. Retrieved 28 July 2012. LATUDA® (lurasidone hydrochloride) is an atypical antipsychotic agent which is believed to have an affinity for dopamine D2, serotonin 5-HT2A and serotonin 5-HT7 receptors where it has antagonist effects. In addition, LATUDA is a partial agonist at the serotonin 5-HT1A receptor and has no appreciable affinity for histamine or muscarinic receptors. In the clinical trials supporting the U.S. FDA approval, the efficacy of LATUDA for the treatment of schizophrenia was established in four, short-term (6-week), placebo-controlled clinical studies in adult patients who met DSM-IV criteria for schizophrenia. In these studies, LATUDA demonstrated significantly greater improvement versus placebo on the primary efficacy measures [the Positive and Negative Syndrome Scale (PANSS) total score and the Brief Psychiatric Rating Scale-derived from PANSS (BPRSd)] at study endpoint. A total of five short-term placebo controlled clinical trials contributed to the understanding of the tolerability and safety profile of LATUDA. LATUDA was approved for the treatment of schizophrenia by the U.S. Food and Drug Administration (FDA) in October 2010, and launched by Sunovion in February 2011 in the U.S. Launched in Canada for the treatment of schizophrenia in September 2012. In addition, Phase III study is ongoing in the U.S., Europe, etc. to test the hypothesis that LATUDA is effective in the long term maintenance treatment of schizophrenia. Bipolar I Depression: Submitted in the U.S. and Canada. In addition, plans to submit an MAA in Europe through Co-development with Takeda Pharmaceutical. (Phase III in Europe). Bipolar Maintenance: Phase III in the U.S. and Europe, etc. Seattle Genetics, Inc. today announced that Health Canada has issued a Notice of Compliance with conditions (NOC/c), authorizing marketing of ADCETRIS for two lymphoma indications: (1) the treatment of patients with Hodgkin lymphoma (HL) after failure of autologous stem cell transplant (ASCT) or after failure of at least two multi-agent chemotherapy regimens in patients who are not ASCT candidates, and (2) the treatment of patients with systemic anaplastic large cell lymphoma (sALCL) after failure of at least one multi-agent chemotherapy regimen. The indications for ADCETRIS were authorized based on promising response rates demonstrated in single-arm trials. No data demonstrate increased survival with ADCETRIS. “The approval of ADCETRIS in Canada marks a significant milestone for patients with relapsed HL or sALCL who have had few new treatment options in several decades,” Joseph M. Connors, M.D., FRCPC, Clinical Director, Center for Lymphoid Cancer at BC Cancer Agency in Vancouver, Canada. Health Canada grants NOC/c, a form of market approval, on the basis of promising evidence of clinical effectiveness, for products intended for the treatment of serious, life-threatening or severely debilitating illnesses that meet a serious unmet medical need or demonstrate a significant improvement in the benefit/risk profile over existing therapies. Conditions associated with market authorization under the NOC/c policy include a requirement that Seattle Genetics conduct clinical trials designed to confirm the anticipated clinical benefit of ADCETRIS in these patients. Two confirmatory phase III clinical trials evaluating ADCETRIS in the front-line treatment setting of HL and mature T-cell lymphoma (MTCL), including sALCL, are currently underway and enrolling patients. ADCETRIS (brentuximab vedotin) was issued marketing authorization under the NOC/c policy based on results from a single-arm, phase II pivotal trial in HL patients with relapsed or refractory disease following an ASCT and a single-arm, phase II pivotal trial in relapsed or refractory sALCL patients. ADCETRIS is administered in hospitals through IV infusion over 30 minutes every three weeks and patients who achieve stable disease or better should receive a minimum of 8 cycles and up to a maximum of 16 cycles (approximately one year). ADCETRIS is the first in a new class of antibody-drug conjugates (ADCs) to be approved in Canada. Using Seattle Genetics’ proprietary technology, the ADC consists of a monoclonal antibody directed to an antigen called CD30. The monoclonal antibody is connected to a cell-killing agent by a linker system that is designed to be stable in the bloodstream but to release the cell-killing agent into CD30-expressing cells, resulting in target cell death. The CD30 antigen is known to be expressed on the Reed-Sternberg cells of HL and on sALCL, an aggressive type of T-cell non-Hodgkin lymphoma. Lymphoma is a general term for a group of cancers that originate in the lymphatic system. There are two major categories of lymphoma: Hodgkin lymphoma and non-Hodgkin lymphoma. Hodgkin lymphoma is distinguished from other types of lymphoma by the presence of one characteristic type of cell, known as the Reed-Sternberg cell. The Reed-Sternberg cell generally expresses CD30. Systemic ALCL is an aggressive type of T-cell non-Hodgkin lymphoma that also expresses CD30. 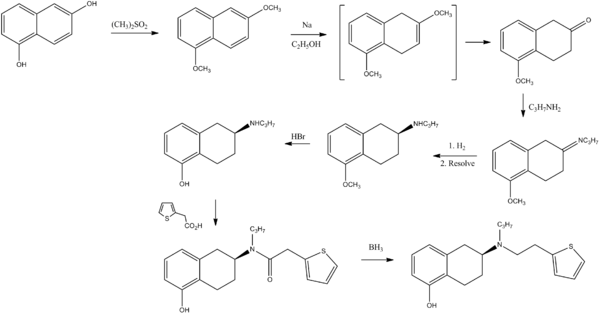 Brentuximab vedotin (INN, codenamed SGN-35 and previously cAC10-vcMMAE) is an antibody-drug conjugate approved to treat anaplastic large cell lymphoma (ALCL) and Hodgkin lymphoma. The U.S. Food and Drug Administration granted the agent an accelerated approval on August 19, 2011 for use against these two diseases. It is marketed as Adcetris. The compound consists of the chimeric monoclonal antibody brentuximab (which targets the cell-membrane protein CD30) linked to three to five units of the antimitotic agent monomethyl auristatin E (MMAE, reflected by the ‘vedotin’ in the drug’s name). The antibody portion of the drug attaches to CD30 on the surface of malignant cells, delivering MMAE which is responsible for the anti-tumour activity. Hence it is an antibody-drug conjugate. In a 2010 clinical trial, 34% of patients with refractory Hodgkin Lymphoma achieved complete remission and another 40% had partial remission. Tumor reductions were achieved in 94% of patients. In ALCL, 87% of patients had tumors shrink at least 50% and 97% of patients had some tumors shrinkage. On 28 February 2011 a Biologics License Application (BLA) was submitted to the U.S. Food and Drug Administration (FDA) for the use of brentuximab vedotin in relapsed or refractory Hodgkin’s lymphoma and relapsed or refractory systemic anaplastic large cell lymphoma. Both indications were approved by the FDA in Aug 2011. For these same indications brentuximab vedotin received a conditional Marketing authorization from the European Medicines Agency in october 2012. Francisco, Joseph A; et al. (2003). “cAC10-vcMMAE, an anti-CD30–monomethyl auristatin E conjugate with potent and selective antitumor activity”. Blood 102 (4): 1458–1465. doi:10.1182/blood-2003-01-0039. PMID 12714494. “Seattle Genetics and Millennium Report Positive Data from Pivotal Trial of Brentuximab Vedotin (SGN-35) in Relapsed or Refractory Hodgkin Lymphoma at ASH Annual Meeting”. Dec 2010. “Is Seattle Genetics the Next Big Thing?”. 2 Dec 2010. “Seattle Genetics Submits BLA to FDA for Brentuximab Vedotin in Relapsed or Refractory Hodgkin Lymphoma and Systemic ALCL”. 28 Feb 2011. BYSTOLIC as tablets for oral administration contains nebivolol hydrochloride equivalent to 2.5, 5, 10, and 20 mg of nebivolol base. In addition, BYSTOLIC contains the following inactive ingredients: colloidal silicon dioxide, croscarmellose sodium, D&C Red #27 Lake, FD&C Blue #2 Lake, FD&C Yellow #6 Lake, hypromellose, lactose monohydrate, magnesium stearate, microcrystalline cellulose, pregelatinized starch, polysorbate 80, and sodium lauryl sulfate. Health Canada has issued a notice of compliance for Forest Laboratories Canada’s hypertension therapy, Bystolic (nebivolol) tablets. The company anticipates making the hypertension medication, that is to be administered once a day, available to patients across Canada in the second quarter of 2013. Nebivolol is a beta adrenergic receptor blocking agent which is metabolized by various routes such as glucuronidation and hydroxylation by CYP2D6. Possible factors that allow Bystolic to act as antihypertensive agent include decreased heart rate, decreased myocardial contractility, diminution of tonic sympathetic outflow to the periphery from cerebral vasomotor centers, suppression of renin activity and vasodilation and decreased peripheral vascular resistance.